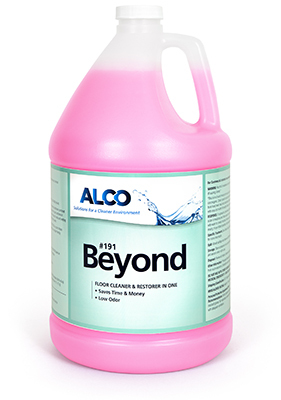 Alco Beyond - Alco-Chem, Inc. Specially formulated to clean and repair scratches in worn finish areas. Excellent conditioner on rubber flooring. Leaves microbase of resins and wetting agents resulting in the "wet look" when buffed at high speed. For optimum shine floors, use Infinity Floor Finish and Beyond Restorer.